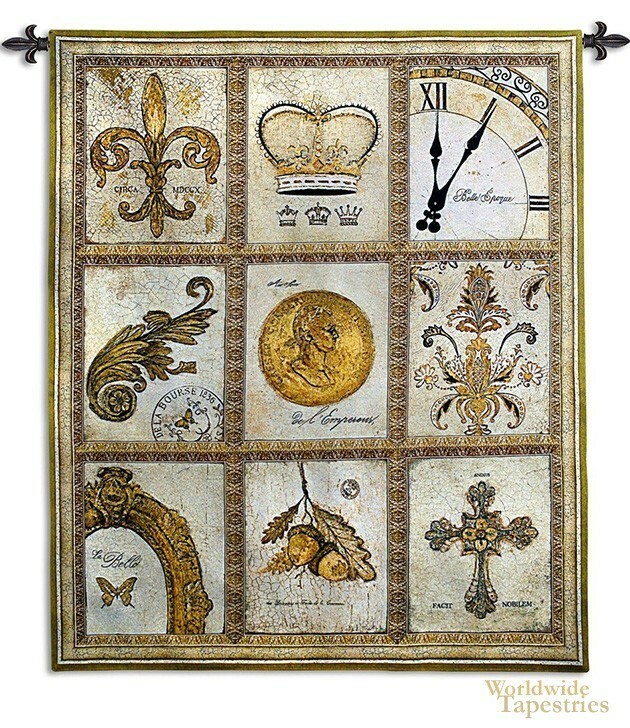 Nobility tapestry shows a montage of elements representing royalty and luxury over the 19th century. Here in this elegant work, we see the symbols of life as a member of nobility. We see the crown and fleur de lis which are symbols of royalty. We also see scientific and technological symbols such as the clock face, the study of flora and fauna, as well as the motifs of the cross and a gold coin. The color palette is beautiful with golds, silvers and beige browns. This is a tapestry celebrating the riches and noble life in the 19th century. Nobility tapestry is backed with lining and tunnel for easy hanging. Note: tapestry rod and tassels, where pictured, are not included in the price.